The DWS2400 is the worlds first digital wireless system operating in the 2.4GHz range. Analog Wireless Systems always require a compander system to reduce the signal to noise ratio to an useable level, meaning the signal is being compressed in the transmitter and on the other side decompressed in the receiver. This method is required in every analog wireless System. Unfortunately this limits the range of dynamic, in particular for guitarists and bass players. With the digital wireless transmission the analog technology will become redundant. The signal gets converted through a high profile Delta Sigma 20bit AD-Converter in the transmitter into digital data. frequency modulation of an analog system. The result is a christal clear sound without hissing. 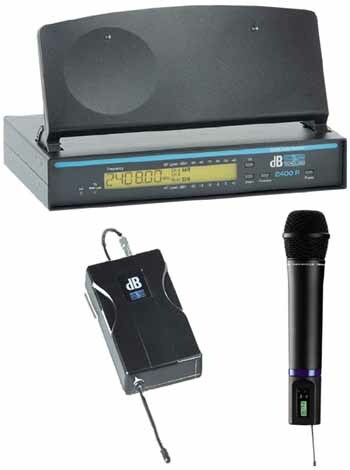 The frequency range of a DWS2400 System means CD-Quality. The sampling rate of 44.1KHz gives a range of 20Hz to 22KHz. Analog systems only manage a range of 50Hz up to 15KHz due to the method of construction. The DWS 2400 works on a 2.4GHz basis, basically the upper UHF range, allowing an enormous amount of broadband data transmission. This method requires a special antenna technique, which db Technologies implemented in the 2400 R receiver, the so called PATCH - Antenna. This is mounted on top of the receiver and can be flipped up easily. The DWS2400 System works on the principle of true diversity technology, meaning two separate receiver channels work independently controlled by intelligent electronics to always process the best incoming signal makeing the system as reliable as possible. The known latency ( delay ) of digital signal processing is 2 ms and therefore not noticable for the user. For Vocal Artists . The ergonomic shaped handheld microphone, made out of rugid metal and integrated display is available either with a dynamic hypercardoid beyerdynamic TG-X 58 capsule or with a high quality beyerdynamic condenser capsule. For professional guitarists and bass players. The DWS2400G comes in a carbon fiber housing and a adaptor cable (6.3mm Jack) for instrumental amplifiers.